FORGET TAXI AND CARS, YOU ARE ON HOLIDAY !!! Mariposa Suite is a luxurious ocean view apartment. On the top floor of the Copacabana complex, in the "Bloco de Luxo", the most exclusive of Mindelo. Mariposa Suite has large bright and bright spaces and its finishes are of a high standard. It is furnished with furniture built by Craftsmen of Mindelo and is complete with all European style comforts. All linen comes from Italy as small household appliances. The supply of water, light and gas is never interrupted because it is centralized. Suite Mariposa is composed of a large air-conditioned living room with a terrace, overlooking the courtyard, a fully equipped kitchen with separate laundry area with washing machine and dressing room. In the sleeping area with a beach view, a double bed air-conditioned suite with a third bed, a private bathroom with Jacuzzi tub, another double room which can be used as a double bed and another bathroom. - Secure private parking with access by remote control. - Free WI-FI and LED TV 43 Netflix, HI-FI stereo system. - Cleaning and linen change every week. - A Cape Verdean card at your disposal during your stay. - Bedrooms: air conditioning, parquet, iron with ironing board, sheets, fitted wardrobes with mirror, safe. - Bathrooms: hairdryer, spa bath, towels. - Kitchen: stove, traditional electric oven and microwave, kettle, toaster, moka coffee maker, pots, cutlery, water glasses and wine glasses. - Laundry: drying rack, washing machine, sink for washing clothes. - Dining room: air conditioning, complete set of tableware, flat screen TV, terrestrial satellite, dvd player, hi-fi stereo system, sofa for six people. - Organizing excursions to the nearby island of Santo Antao with Leo, our trusted guide. Suite Mariposa can comfortably accommodate five people: two couples or one family with two or three children. There is a cot for children. Inside the Copacabana complex you will find a restaurant / pizzeria, a boutique and a gym. The seafront, starting from the Mariposa Suite, is the ideal runway for the morning and the evening by mindelo runners. In a ten minute walk, on the seafront of one of the world's most beautiful bays, you reach the center of the city. At your disposal you will also find some outdoor exercise equipment. The Copacabana complex is equipped with elevators and is under surveillance H24. When we arrived Vanda welcomed us pretty nicely. The apartment was perfectly located nearby the sea, the view was amazing. We could reach everything by walking. We didn't miss anything there. Vanda even gave us a mobile-phone just for all cases. We had a very pleasent and secure stay there - thanks a lot, Vanda, for everything. We shurely will return soon. L appartement est conforme au descriptif. Toutes les commodités. L appartement est très bien situé. proche du centre ville 10 mn à pied par le bord de mer. Plage bordée du port et d un chantier naval : dommage autrement c'est pas mal. Snack Kalimba sur la plage plutôt sympa et transats à disposition gratuitement en cette période :janvier. Pizzeria en bas de l immeuble : pizzas extra bonnes. Dans appartement il manque cependant des fauteuils +petite table sur terrasse pour pouvoir déjeuner dehors. Mais séjour agréable et bonnes prestations pour le pays. Logement à conseiller. Vanda est accueillante et sympathique. Elle est à notre écoute en cas de besoin. Un téléphone portable est à notre disposition pour appeler dans le pays ce qui est plutôt pratique. Merci Baldo & Anne Marie pour votre avis. Nous nous félicitons de votre demande de fournir une table et des chaises pour Suite Mariposa et la prochaine fois que seront nos invités seront les trouver à votre disposition. Nous étions les invités d'exception et nous serons très heureux de vous accueillir à nouveau. Marie grâce au nom de Wanda et l'ensemble de l'équipe Suite Mariposa. Vous serez notre invité bienvenu pour vos prochaines vacances à Mindelo. We stay 5 days in this flat close to the Beach. The flat is perfect: quite, clean, modern, well equiped, Wifi very fast. 20 minutes walk from the center or bus every 5 minutes. Close to the ferry to Santo Antao. Good and cheap restaurant "Caravela" on the beach. Wanda is very sympatic and useful for any help or information. It wil be very pleasant to come back again. We recomand strongly this flat. Grazie Mille Marie and André. Vi aspettiamo a Suite Mariposa. Suite Mariposa has an ocean view, is located in front of Praia Laginha, a 10-minute walk from the center and three landing stage to Santo Antao, the top floor of the prestigious luxury complex Copacabana. You can reach in a few minutes walk is all you need. FORGET CAR AND TAXI !!! It is 15 minutes drive from the airport. All taxi drivers know Copacabana, the main entrance is at the bottom on the right, Avenida Marginal, next to Moave. It is a 10-minute walk from the central square Praza Nova. The ride is very pleasant because it is on the waterfront. The Laginha beach is 10 meters from the entrance of Copacabana. The Laginha beach is the beach of mindelensi. Every day, summer and most weekends at other times of the year, there are concerts, festivals and events. 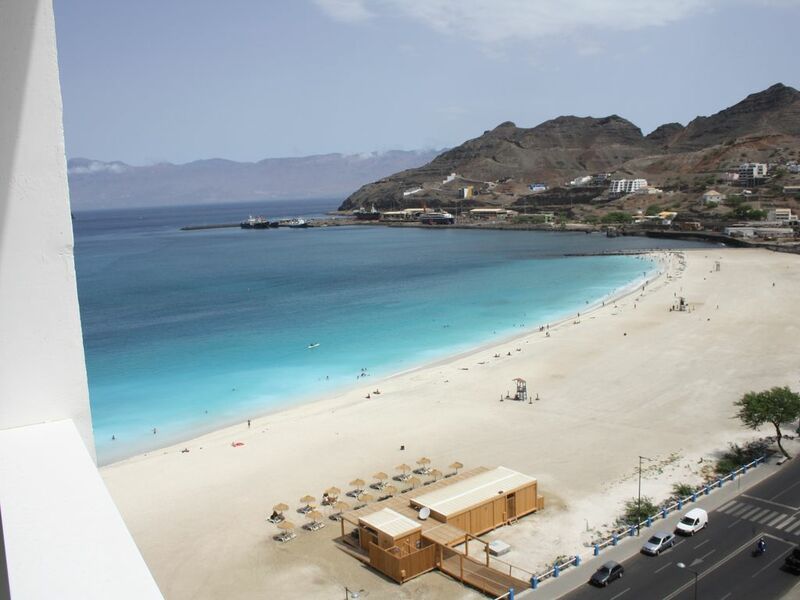 Especially in summer, in front of Suite Mariposa, the Laginha beach and its local characteristic, become the heart of nightlife of Mindelo button. From Laginha you reach the center of Mindelo 10-minute walk along the promenade of Porto Grande, in a bay considered among the most beautiful in the world. Staying at Suite Mariposa you will not need to use the car. Are a must: the colorful heart of Mindelo and its always crowded rooms, where the evening playing live, the Municipal Market, the characteristic fish market, the praza Estrella and its vendors. The Sao Pedro beach, beach fishing, surfing and windsurfing, on the airport road; Baia das Gates, where in the month of August is one of the most important music festival in Africa; Praia Grande, the most beautiful beach of the island, where at any time of the year you can swim in the Atlantic Ocean in total solitude, even practicing bodysurfing; the beach Salamansa the kitesurfing paradise. All the beaches are easily reached from Suite Mariposa at a cost of no more than € 20 by taxi, or about half with taxis (aluguer), which are located in Praza Estrella. La casa non è nata per essere affitata. I mobili sono realizzati su misura. La biancheria è stata acquistata in Italia. Ti preghiamo di considerare questa casa come la tua e di segnalarci come possiamo renderla ancora più confortevole. Ricordati sempre di aprire le finestre del locale lavanderia dove ci sono i motori dell'aria condizionata quando sono accesi i condizionatori per evitare che si surriscaldino i motori. Rispetta le regole del condominio ed evita i rumori molesti nelle ore notturne.